A southern soul cult figure, Arthur Lee “Pep” Brown came from Macon, GA and has been associated throughout his career with Alan Walden, whose involvement in music goes back to the days when his brother Phil managed Otis Redding. 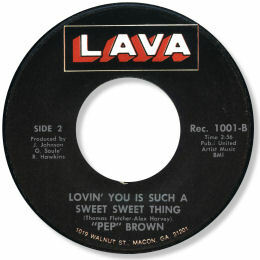 Brown’s first two singles for the Lava label, especially set up for the man, were cut at Muscle Shoals and are vintage music. Perhaps the best cut is the lively Lovin’ You Is Such A Sweet Sweet Thing but the rather more readily available coupling of “Think About The Children” and the very tasty beat ballad “Are You Leaving Me” is first class as well. Names like George Soule, Roger Hawkins and Jimmy Johnson on the discs mean so much. These first recordings reveal Pep’s vocal chops as being heavily influenced by Mr Redding but he was also a fine tenor singer in his own right, with a good sense of timing, a wide range and a nice hoarse tremolo touch. However it was the trips to Memphis that Walden arranged that resulted in his masterpiece. Bowlegs Miller and Walden directed the throwback sound that set Pep’s anguished tones in a perfect context to deliver a double sided helping of deep soul heaven. Is It All Over is as good as this music gets, and Is It Too Late matches it for tone and emotional impact. This track is in fact an uncredited version of Ollie Nightingale’s Pride cut “I Gave Her Everything But What She Needed” and there is a view that Polydor simply got the title, an easy alternative to the top side’s tagline, wrong in the pressing. Another view, based on the writer’s credits, is that it is blatant plagiarism. 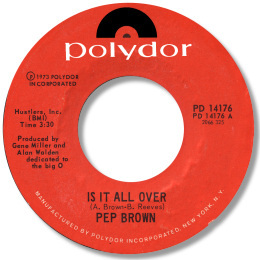 In any event, the fact that his first Polydor 45 is “dedicated to the Big O” says all you want to know about where Walden was trying to take Brown, and why this single is simply essential. Inevitably, his second Polydor 45 suffers by comparison, but in another artist’s CV the midpaced dancer I Am The One Who Needs You would be a standout. The funky “Don’t Blame Me” isn’t bad either. In many ways it is a pity that these cuts found their way to Polydor, whose knowledge of and distribution of this sort of music must have been sketchy to say the least. Also it has meant that they’ve been criminally overlooked by southern soul fans. On a more fashionable label – Fame say or Stax – they would have received their proper due by now. 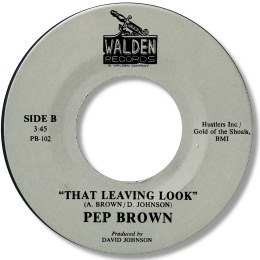 Pep Brown resurfaced on Walden’s own label in the 80s under the supervision of country soul maestro David Johnson, but these tracks sadly have a large touch of the synths about them. Modern soul fans like the dancers “This Good Thing That I’ve Got” and (It’s All About) Money” apparently, but the only cut worth more than a first listen is “That Leaving Look” which, had it been given real instruments and a horn section, would have been a real killer cut. My spies tell me that there are a considerable number of Pep Brown recordings from the Golden Age lying unissued in the can. What a treat it would be to get them out in the open. UPDATE Amazingly my friend Yass has found a second issue Polydor 14176 which looks pretty similar to the first one but has the "real" cut of "Is It Too Late" on it! This mid pacer featuring some strange country guitar can be heard here. Thanks to Yass for some excellent detective work.